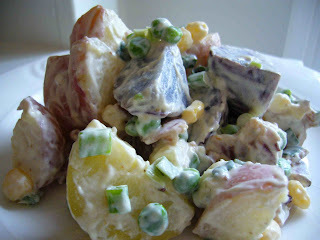 We needed one more side for our 4th of July picnic yesterday and what could be more appropriate than a potato salad? My local market was selling blue potatoes so I picked up a total of 2 pounds of blue, red and white creamer potatoes and mixed them with some other veggies for a different take on potato salad. Cut potatoes into half inch chunks and place in a pot with enough cold water to cover. Bring to a boil and let boil, uncovered, for 15 - 20 minutes until just fork tender. Drain potatoes and spread out on a baking sheet to cool. While the potatoes are boiling, cook the bacon strips and allow to drain on paper towels. Chop bacon and place in bowl with cooled potatoes, corn, peas, scallions and blue cheese. To make the dressing, combine mayonnaise, mustard and lemon juice in a bowl and mix. If you're not a huge fan of mustard, start with two tablespoons and only add the third if you think the dressing needs it to cut the mayonnaise further. When you're happy with the taste of the dressing, add it to the bowl of potatoes and mix until combined. Salt to taste and let mellow in the fridge until you're ready to serve. Enjoy!